For the dressing, Combine the following: ½ c oil, ¼ c vinegar, ¼ c sugar, 2 T soy sauce, heat until sugar is dissolved, then set aside. Melt the butter and add the almonds, sesame seeds, and broken-up raw Ramen noodles. Stir-fry until slightly browned and remove from heat. 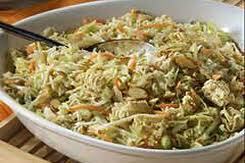 Add this warm mixture to the cabbage and add dressing. Stir well. Best if the salad is combined just prior to serving.